Health and Nutrition have been a passion of mine for many years and it was in this setting that I got my greatest support when diagnosed with breast cancer. Along with my medical doctors, my Wellness Team provided the support and knowledge that I needed to determine my treatment protocol and complete it. Inspired by their care and the wish to do the same for others I became a cancer coach. The cancer coaching program was designed for and by Health Care Professionals to fill a void in cancer prevention, treatment and recovery. We as coaches come from various backgrounds including doctors, nurses, psychologists and nutritionists. My background is in nutrition. 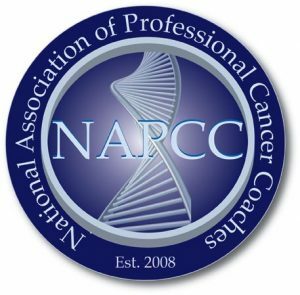 I am a member of the National Association of Professional Cancer Coaches and of the Professional Cancer Coaches International Inc. Protocols offered by us to our clients are solidly rooted in evidenced based research and are continually updated to reflect current findings. I firmly believe that a comprehensive cancer protocol must include a strong nutritional and lifestyle component to be truly effective. As part of your wellness team I will work with you to personalize the nutritional and lifestyle aspects of care relevant to your cancer and through all phases of protocol including treatment, recovery and prevention. I am a cancer coach now because I was a cancer patient before. As I incorporated each of them into my own protocol, I understand intimately both conventional and alternative approaches to treatment. And I understand the emotions tied to a cancer diagnosis. I want to be a part of the new direction of cancer care; one that considers the whole person and the whole disease. I believe in hope. I believe that inner strength is limitless and I believe that both are fostered by knowledge and empowerment.